So i have been hearing bad experiences from seniors about this particular module offered to the final year student, Web Design and Application. It was said to be a time-consuming module and the professor has a high expectation on the students. However I was kind of shocked when the professor actually is a very friendly and helpful person. Perhaps they were talking about some other professors? Anyway, I installed XAMPP on my Window 7 today. Faced some problems that I am going to note them down. 1. Download XAMPP Portable Lite 1.8.3 PHP 5.5 ZIP file from here. 2. Extract it and move the files to Desktop. 3. Double-click on setup_xampp window batch file. Wait for it to initialize and complete. – Apache stopped unexpectedly. >> I stopped MySQL service under Administrative Tool>Service but it doesn’t help. Check for other application that might be using Port 80 (e.g Dreamweaver) but I couldn’t find anything (in fact, I don’t know what else). – MySQL path in used >> Uninstall the previously installed MySQL. Finally, I stopped Web Deployment Agent Service and changed it to “Manual start”. Only then I could start MySQL on XAMPP. The professor said, the best way of learning is to be active and engaged. Do not be scared to ask questions and to clarify. We make mistakes in order to learn. There is nothing wrong to copy but you have to modify it. One nice thing I like about the professor is that he give chance (first warning) to students. At least if you make mistakes unknowingly, you could change for better. So i was renown for being a “Spoiler” because i always cant’ wait to tell my sisters what’s going to happen in the drama series. 😡 So, i spoilt quite a few things last week including my sd card and SIM card. My Web2py web app couldn’t work as well. I asked around in the forum and Google group, desperately finding answers. Then, i reconnect everything and hey, where is the error? ARE YOU SERIOUS? 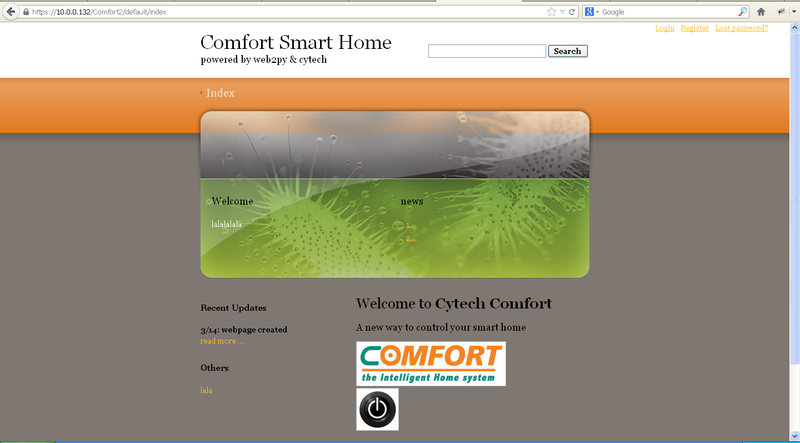 i logged into the Comfort system from my web2py app?! Then, i added another serial command to turn on the light… it turned on. i was shocked. Seriously, totally have no idea what is going on. I didn’t change anything, did I? Anyway, now i will start hesitating between web2py and cherrypy, again. Update on cherrypy progress, i manage to get the keypad out but have not able to use it to let user to sign in. I have been lazying out on Raspberry Pi recently. Stuck at getting the web app on web2py to open the port at ttyAMA0. However it works fine on CherryPy. Would it be better to just focus on CherryPy? but i think Web2Py is newer and probably better and easier! That is if and only if i am determined enough to finish reading (and digesting) through the 583 pages web2py manual. But it is so tiring to read it through the screen and time-wasting to study during working hours. If only i have an iPad or something. Not sure if it is a good idea to learn web2py and cherrypy concurrently. just hope that Mr Massimo can solve my problems soon. Understood some Z-Wave problems today. – EH, FINISH UP MY PROJECT REPORT! Good Day! i got stuck in testing the new Z-Wave firmware so here I am, back for more CherryPy! Let me restart my CherryPy journey and you can refer to my discussion with mefarmer in this forum thread. Do download the mobile_website.zip from there too as i could not upload the file here. The last time i edited the tutorial.conf file by changing the port number and tools.staticdir.root. But the web app wouldn’t show up when i type in the localhost:portnumber. Today, i changed the port number to 8020 which is not in used by any server. I think Web2py has taken up localhost:80 by default and :8080 seems to have some error… i did use it to display “Hello world” from the tutorial file included with the installation. Anyway, moving on to remote_control.py. Adding #!/usr/bin/python will allow user to run the script automatically by typing python myscript.py in the terminal. 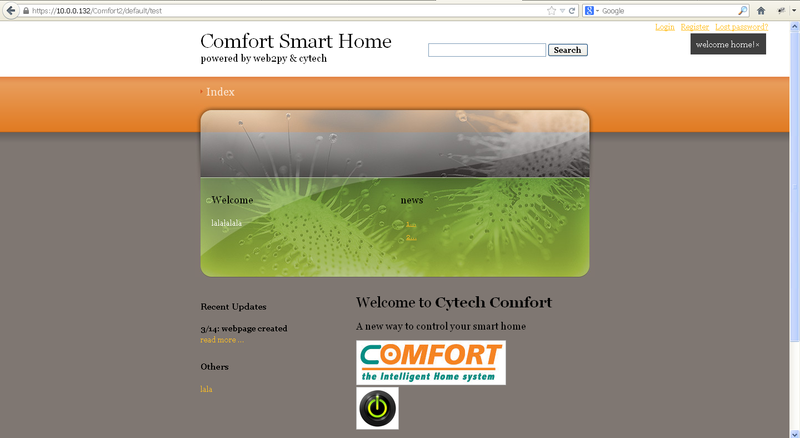 remote_control.py, when run, will return a html file (webpage) which shows a sleek nice black layout with 3 buttons in the first row and a slider in the second row. The jQuery Mobile framework is using a block style class convention called ui-grid. Within the grid container, child elements are assigned ui-block-a/b/c/d/e in a sequential manner which makes each “block” element float side-by-side, forming the grid. The ui-block-a class essentially clears the floats which will start a new line (see multiple row grids, below). – somehow i need to use a new port number. then i run the python script. – it’s a success! i got the reply from the device connected to its serial port. inside the function, outside the “if”? local name “serialport” is not defined. IMPORTANT! while i edit the python file, i did not shutdown the server. After i saved my changes, the server will “re-spawn”? i take that as a restart. haha, CherryPy coming back to life huh? Yesterday i got to know a new friend called CherryPy, a lovely sweet lady? No, it’s a “minimalist Python Web Framework”. Someone replied to my forum topic and he explained quite a lot about web application. CherryPy seems to be a good alternative to web2py although she is older. 1. So, let’s start off by installing CherryPy in our RaspberryPi by downloading the tar.gz file from here. 2. Save it in your home/pi directory and open up the LXTerminal. 8. Open your browser (Midori or iceweasel or something else on R-Pi) and type http://localhost:8080 or http://127.0.0.1:8080 at the address bar. To stop the server, press CTRL+Z. CTRL+C. Now i will download the file from the forum and see what he has got for me! 3. Move the extracted files into the folder. Today is more fruitful than yesterday. I found out an awesome function in the web2py Administrative Interface. It is the “New Application Wizard” which will guide you through creating the most basic webpage. So today i created a skeleton of my web app using the application wizard. Then i edited the layout.html, index.html, and default.py. I created default/test.html in accordance to the new function test() created in default.py. Also, i uploaded some pictures. However i could not proceed to send the serial commands (which is my main purpose!!) to the device i wish to control through Raspberry Pi. Web2py plugin KIV for next week! I’m going to explore more about Web2Py starting next week. And here is an awesome site! Meh, can’t find any solution from the web. in your same network window command prompt. CTRL+O to save and CTRL+X to exit. You can do the same thing on Raspberry Pi as well and ping to your same network computer. Remember to set an admin password when prompted! then click “Admnistrative Interface” and it will prompt you for a your password! And there you go! server up and running! But i am still wondering why must I install web2py… by right, after reinstalling apache, it should give me “It works!” or something.